Asmahan first saw the sword dance performed by Bal Anat at the Renaissance Pleasure Faire in San Francisco. Jamila Salimpour had researched the history of Oriental Dance and had an extensive library of books. She based the performances of her dance troupe on the authentic culture of Arabia. Napoleon led an Expedition to Egypt in 1798, he brought intellectuals and scientists to record the facinating culture he discovered. The result of this expedition was a four volume masterpiece of research, Description de L'Egypte, compiled by Devon. In it was the architecture, lifestyle, costumes, customs, and content of the culture of Egypt. Jamila wanted to create a look for Bal Anat that would be that of the dancers before any influence from the West. She called this Pre-Napoleonic style. 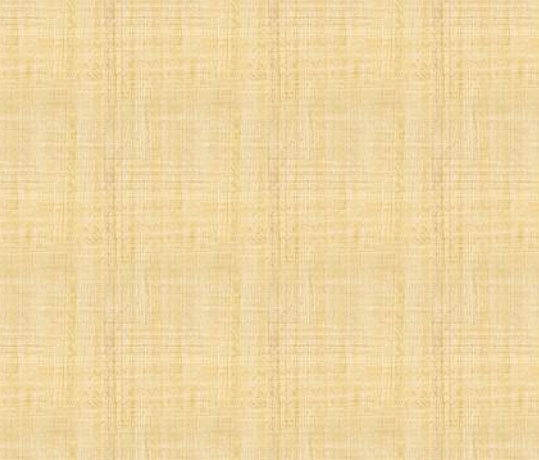 This meant using the fabrics, materials, jewelry, hair style, make up, instruments, and look of Middle Eastern dancers as recorded in their true cultural identity. Many other travelers, painters, poets, and historians went to the Middle East at this time and wrote descriptions of the dancing girls they encountered. Jamila's idea for Bal Anat was to make the costumes, dancing, and music based on the writings and paintings of the Orientalists. One of the most famous paintings from this time was by Gerome. It is called La Danse du sabre dans un cafe. It depicts a dancer performing while balancing a sword on her head. Gerome saw this dance in Cairo and did the painting in 1870. (The mystery and impact of this painting is overpowering. To see this painting will change any artists life. It is so realistic you feel it is alive.) There is no written description of this dance in historical accounts or travelers journals. So this painting inspires one to imagine what this dance looked like. Asmahan saw Rhea perform this fabulous dance with Bal Anat, balancing a sword on her head. This was this dance that really impressed the audience and inspired her to become a dancer. Rhea's style was more Turkish and Greek and was very fast. Although Asmahan studied extensively with Jamila, the sword dance routine was not taught in class. Asmahan now was a professional dancer and was performing at the Casbah and the Greek Taverna. She was designing and making costumes for a Persian import shop, the Lion and the Sun,where she purchased silver Persian coins from the Shah of Iran. Drilling all the coins and making body jewelry was gruelling work, but she made two coin belts and two bras. She bought a balancing sword for $100.00 and began to teach herself how to balance and dance with it on her head. 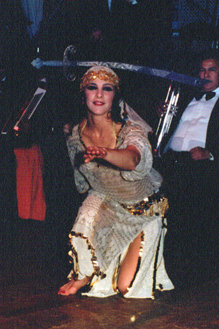 Asute fabric, lots of authentic Arabic jewelry, and the coin belt and bra were used to make a costume for this dance. It was based on the painting of the Ouled Nile, Ghawazee, and Beduoin tribes. She based her routine on what Rhea did and practiced at home for two years, just learning to walk with the sword on the head took months. One weekend she danced at the Renaissance Faire but she was not a member of Bal Anat. After performing in San Francisco for three years, she sold all her possessions and left to dance professionally in London. The most prestigious places to dance in the world were: Cairo, Beruit, London, Paris, Istanbul, Damascus, and Dubai. The star dancer, or vidette, did a costume change and most of them danced with a cane, called the Assaya routine. Asmahan danced in all the most prestigious clubs in London. The top musicians from all over the Middle East were playing in the orchestras. It became an opportunity to research the history of the sword dance. The musicians come from families that have been musicians for generations. They are like castes, where a skill is a family tradition. In Cairo they come from the Mohammed Ali area. When asking a musician to speak to his grandfather about his knowledge of the existance of the sword dance, this meant that some of the information could go back 150 years. After two years of inquiring about any memory of a dancer balancing a sword in a dance routine, Asmahan came to the conclusion that this was a lost dance, in terms of being performed in Cairo for at least the last hundred years. An Iraqi singer knew of a double dagger dance that Iraqi dancers did, but they did not use large swords or balance them on their heads. When she showed them the painting by Gerome they were amazed by it and said it looked fantastic and she should do it. From all the information gathered, it seemed that the most likely source of this dance had been that it was a tribal dance performed by the gypsies. The Beduoin, Ghawazee, and Ouled Nail were the most famous of the dancing tribes but this did not fit their style. The Ottoman armies had tribes of gypsy armourers who followed the soldiers and repaired their swords, shields, spears, helmuts and armour after battles. It probably occured that at night when the music and dance was performed around the campfire, the gypsy girls danced with the swords and did acrobatic dancing and balancing that must have been a delight and pleasure to behold. The Iraqi and Saudi men still have sword dancing in their folklore tradition. In the Middle East there is a tradition of dancing while balancing something on the head. This can include a tray, pot, glass, or candleabra. It is very possibe that balancing a sword would be a likely dancing skill. It would have been from a mix of cultures included in the Ottoman Empire. This would be Turkey, Arabia, Egypt, Syria, and North Africa. While performing at Sultan's Palace, Asmahan worked with Rais Metqal Qenawi Metqal. He was a virtuoso in his field, the renowned rababa of Les Musicians du Nile. (They are the most famous group of Saidi Musicians from Upper Egypt, who have traveled all over the world as ambassadors of Egyptian Folkloric Culture). His son Hagag was only nine years old and was playing tabla for the group. She asked Metqal to help her with information about what this dance must have been like. He had never heard of anyone doing this dance in Egypt. But by the very nature of the sword the dance must be a bit of Martial Arts in structure. The Saidi Cane Dance the men perform in Upper Egypt has elements of combat and striking the stick. He thought it would look good to have these elements. Asmahan brought in her sword and showed him her ideas for the format. Her sword was very slightly curved, with a blunt but pointed end, and with a staight handle. It worked perfectly substituting it for the traditional assaya, and using the Saidi Music. So the structure of the dance was taking shape. Asmahan did her own choreography. She used some of the moves she had seen the assaya dancers use, some of the martial arts of the saidi men, and some improvised dance steps that just seemed natural. The entrance would be to the Hamama Saidi, which had dynamic movement, tabla accents to hit the floor, and a twirling part which with a sword was very impressive. The next section was a Taksim to do backbends and then go on to her knees, placing the sword on her head very dramatically. Then followed acrobatic floorwork, doing isolations, hip shimmies, lying on her side with arabic undulations, and then turning completely over. While sitting on her knees, she them put on a pair of finger cymbals and stood up with the sword on her head. Now the fast Saidi Music started and she began to play sagats, and started to dance with hip taks and as much movement as possible with a perfectly still and balanced head position. The finale was spinning whirling dervish style with taking the sword in two hands and continuing a centrifugal spin with a drama stop. When working at the Holiday Inn, again for Nagwa Fouad, (while she made a film for two months), Tahia Carrioca came back stage to compliment her on her show. Tahia said it was nice to see a dancer using the classical technique, and Asmahan told her the American dancers were big fans of her films. The next opportunity was a two month contract at the Hayatt El Salem, for Aisa Sheriffe. There was one agency that was representing the dancers to the five star hotels and they would call Asmahan to work for the stars because her show was always successful. The hotel was responsible to provide a show that the clientele liked and a guest could refuse to pay the bill if the dancer was not the star or if they took exception to the substitute. The Nile Hilton had a dancer, Mervat Badri, who they wanted to replace. Asmahan was booked to substitute and this was the first opportunity to secure a contract. All the musicians know the working situations at all the hotels, they know all the other musicians who are working with every other dancer and they meet in the Mohammed Ali coffee shops and share all the news and gossip every night. It is like a communication center and everything good and bad gets passed on everynight, all the news of the dancers experiences gets back to the other dancers through the musicians. They are very loyal to the dancer they work for if they like her. It is the most fantastic feeling in the world to dance to the music of musicians who are playing with their hearts and souls as well as their technique. The musicians wanted Asmahan to get the contract and they had a rehearsal and brought in some new musicians bringing the group up to twenty. This was the best show she had ever produced. After working for two months at the Nile Hilton, the call came from the empressario that the management had been coming to the show and were so impressed they wanted to offer her a contract. At the meeting in the office, the manager of the hotel, Hassan Humza, was astonished that Asmahan was not Egyptian. He was clearly upset that he would have to withdraw the offer of a contract and admit that he was doing so because "she was not Egyptian". A long and polite conversation followed where her empressario said that if she could dance and look good enough to impress the management and the audiences were all happy with the show there should be no problem. But the management at this time in 1981 would not accept a "Foreign Dancer". So she danced another month at the hotel until they found someone else. Then she decided to take a holiday job and took a two month contract at the Sheraton Hurgada, which was on the dead sea and a lovely, relaxing venue to take stock of the situation. While there she met the Area Manager for Hilton Middle East, and he offered her the star postion in a new hotel he was building in the future the the Ramses Hilton. Asmahan had been the first foreign dancer to ever work the five star hotels and after two years of dancing at least two shows a night for seven nights a week she was exhausted and disenchanted. As there was not a possibility of a contract at that time she decided to return to London. This was 1982 and London was a fabulous place to work. All the famous stars were performing, most of them were Egyptian, but there were more international Arabic performers from Lebanon, Syria, Iraq, and the Gulf. Beriut was still in civil war, so the Middle Eastern tourists, businessmen and diplomats used London as their city of choice for holidays, shopping, business, finance, and political alliances. A few were going to Geneva or Paris but London was by far the top city in the world displaying Arabic music and dance after Cairo. Many new venues had opened including the Empress and Elf Leila Wah Leila, which was the next club where Asmahan was a feature dancer. Now she could do a costume change and perform the sword dance as she had danced in Cairo and had "a name". The vidette was Mona Said who had returned from Cairo as well, the singers included Layla Abdel Aziz, Fareg Abdel Karim, Salah Hassan, and Mohamed Gamal. Magdi Houseini played his organ solo. In the orchestra was Ibrahim el Minyawi (who had been Asmahan's tabla player in Cairo), Ahmed Mouad, Shariffe Zaki, Mamoud Rahsad and Ahmed el Hafauwi were two musicians who had worked with Om Kalsum. Another beautiful night club called Cave du Rois opened across the street from the Ritz Hotelin Mayfair. Asmahan was contacted by their agent to perform for a year. This club was frequented by celebrities, and Omar Sharif was a customer. The Star singer was Sabah the most famous Lebanese diva of all time. Other singers included Fahed Bahlen, Isam Raja, Tony Hana, Souad Mohamad, George Wsouf, Ahmed Dowal, Naga Salem and Wadia Safie. The videttes were Zizi Moustafa and Louisa. In the orchestra was Abdel Aziz on kanoon, Emile Basali on violin (who worked with Om Kalsum), Bashir Abdel Al on nai, Sukar el Ghouri on accordian, and Ali Abdou Salem on tabla. She did her costume change and the flute player Sayed played mismar for her sword dance show. The scene in London was very sophisticated and this program brought elegant customers. Next Asmahan was contacted by the owner of many clubs internationally to dance for a six month contract at Paradis du Liban in Tunis. She had just comissioned Mohammed Salem to write new music for her and he had composed a beautiful piece. This would be the first time it would be peformed. The orchestra was the National Radio Orchestra of Tunis and it was composed of the best musicians in the country. The show was a great success and they extended her contract by another two months. Over the next few years Asmahan produced a film in Cairo and London, making all the costumes, having music recorded, scouting locations, organizing props, and co-ordinating all the aspects of the project. It was a personal project made on a modest budget with everything done very resourcefully. It took several years to complete and was shelved for years until the post production money could be found. She designed and made costumes for other dancers and movie stars. The most famous movie star in the Middle East, Nabila Ebeid, had seen her photos at the studio of Bastet. She asked to be introduced and ordered costumes for her upcoming film: Al Raqassa wal Slyassi, where she played the role of a dancer. While in Cairo working on the costumes for Nabila, Asmahan was asked to dance at the Ramses Hilton Hotel. She signed a contract and began producing a show for the summer season. She was training with Madame Raqia Hassan who choreographed her show. The music by Mohammed Salem was used for the magencie. Mohammed Abdel Wahab had just written Mein Ghere Lei, and it was included in the show. The sword dance was of course for the finale. Asmahan made the costumes and Samasen helped as creative consultant. The musicians included: Said Saudi on tabla, Said Askar on accordian, Mohsen Chairi on nai, Amar Abdel Salem on organ, and Hassan Ein on mismar. The band leader was Hamada Abou Zara and Safaa Farid was the singer. The show was very successful, the other artists in the show were Alla Abdel Khallek and Hendia. Now the hotels had booked singers into the five star hotel shows, there were no show ballets. The singers brought a different atmosphere into the shows, and people danced on the stage like they did in night clubs. The year was 1990 and in August Saddam Hussein invaded Kuwait. Business was not affected and Cairo was very exciting, with George Bush coming for diplomatic talks and then every Arab leader. But finally a few days before the Jan 15th deadline for war to start, Asmahan left. The Gulf War had begun. Back in London there was a serious recession, the Middle Eastern art scene was at its all time low. Asmahan worked in Sagghi, an elegant Persian club, and at GoGoush, another Persian club. She sold some of her costumes and made the Pharoahic costume for Nabila Ebeid for her film L'Auture. Again in 1995 Asmahan was signed to the Ramses Hilton Hotel. She again made a new collection of costumes and worked with Raqia Hassan for the choreography. There were two singers, Amr el Ougami and Heba Hamid. The band leader was Hamada Abou Zara and the musicians were: Sukar Artiste on tabla, Mohamed Shedid on accordian, Wahed Asfour on violin, Magdi Saber on organ, Samer Ibrihim on kanoon, Fadil Morsi on nai and kalwah, Attia Abdel Aziz on saxaphone, and Hassan Ein on mizmar. This was a difficult atmosphere in Cairo with alot of problems with Muslim Fundamentalists putting pressure on hotels, artists, musicians, and government officials to stop all entertainment. There were fewer customers and not the elegent, sophisticated, and classy types like before. There were only ten hotel shows working on the weekends, whereas in the past there were a least fifteen hotels working seven nights a week. Many dancers were stopping their work and taking the veil. There were poor prospects for the future and after a year Asmahan decided to return to London. Recently she has performed for the Conservative Party, the British Egyptian Society, British Museum, Egyptian Ministry of Tourism, Turkish Ministry of Tourism, The British Red Cross, Alabina at the Shepherds Bush Empire, Vitality Exhibition, and at society weddings at the major hotels.